Magina, the Anti-Mage is a highly evasive agility hard carry that specializes in disrupting mana-dependent heroes. He is able to do this by way of his first passive ability Mana Break, which removes a fixed amount of mana from heroes he attacks. Additional damage is dealt to these heroes based on a percentage of the mana they lose, thus making Anti-Mage very deadly against spellcasters and heroes with large mana pools. His second ability Blink is exactly what it says on the tin: a short-range instant teleportation ability that allows Anti-Mage to quickly reposition himself on the battlefield, whether for escape, pursuit, or initiation. Blink is what makes him extremely difficult to kill, forcing enemy teams to coordinate their stuns and disables properly during gank attempts. Anti-Mage’s second passive ability Spell Shield works in tandem with Blink, giving him a massive boost in magic resistance. Spell-heavy lineups will find it particularly troublesome, as Anti-Mage can simply shrug off their damage and Blink away to safety. Anti-Mage’s final punishment comes in the form of Mana Void, which deals heavy magic damage to enemies in a small area based on how much mana is missing from the primary target. This can be devastating even in the late game, as heroes tend to have larger mana pools the longer the game goes. Beyond his abilities, there is an agile and precise fighter. Anti-Mage is blessed with an insanely good base attack time, making him great at just carrying straight up with physical DPS. Although he can be kited to some degree, movement speed items and creative use of Blink help solve this problem somewhat. He does, however, have some fairly obvious weaknesses. Anti-Mage does not have a built-in flash farming ability, which makes him quite reliant on Battle Fury as a farming tool. This means that he is pretty much unable to help his team during the early and mid game, thus leaving his teammates to a 4v5 until he acquires his core items. He is also vulnerable to instant disables and silence effects prior to purchasing Manta Style, Black King Bar, or Linken’s Sphere—a weakness that teams can and will exploit. But if he is allowed to farm freely, Anti-Mage can spell doom for the enemy team. Teleporting in and out of combat, he prevents the use of spells by divesting enemy heroes of their precious mana, or by simply cutting them down with his twin blades. Do not trifle with the last surviving monk of Turstarkuri—or you may find yourself quickly silenced by the Anti-Mage. Anti-Mage’s ability progression is not complicated at all, diverging only between Mana Break and Spell Shield depending on the hero composition you’re up against. Blink should generally be the ability you unlock first, as it allows you to escape pre-creep spawn gank attempts while you try to snag one of the initial bounty runes. The same goes for when you’re in lane, where opposing supports might try to get cheeky by diving you with their lane partners. Blink should also be maxed out first, as both its cooldown and cast range get better with every skill point invested. Before hitting Level 6, however, you should have one point each in Mana Break and Spell Shield. Get Mana Void as soon as you are able to, especially if you have a support with you that can help you secure a kill with it. From there, the next ability you should max out depends on the heroes on the enemy team. If you find yourself constantly facing magic-based harassment and heavy nukes, finish building up Spell Shield first to help you survive the trip to the late game. Otherwise, you might want to double down on Mana Break, in order to get aggressive early on or remove as much mana as possible when you find opportunities to harass lane opponents. Surviving the laning phase is the first priority for Anti-Mage, due to his farm-dependent nature and average starting health pool. Purchasing a Ring of Health from the side shop helps immensely in this regard, as it gives Anti-Mage the health regeneration necessary to stay in lane and contest last hits. This, of course, has the bonus of being a component of Battle Fury, which will be purchased going into the mid game in order to accelerate farm. Speaking of Battle Fury, you should generally aim to have it in your inventory by the 15 to 16-minute mark—but try not to skip Boots of Speed entirely just to hit this goal. Getting Battle Fury as fast as possible is important, of course, but so is giving yourself a good amount of movement speed to work with in the early game. Once you have your Battle Fury, though, make sure to use Blink to get around the jungle and the nearest lane, cleaning out creeps as you go. As you approach the late game, the true DPS core items will start to come in. In the middle of farming, buy yourself a Yasha, which will later become a Manta Style. Yasha accelerates your farm in a way that Battle Fury doesn’t: by increasing your attack speed and agility. Manta Style, on the other hand, increases your teamfight DPS, with the added bonus of giving you an extension to your already potent escape mechanism. The active ability also purges silence effects and other debuffs, making it great for shrugging off things that would otherwise slow you down. Once you have Manta Style on hand, you can start participating in teamfights. You generally want to aim for intelligence-based supports first; after all, you are the Anti-Mage. Eliminating supports first will make it much easier for your team to move around and operate during engagements, as doing so gets rid of annoying and irritating abilities. Basher into Abyssal Blade should be your next option most of the time. Later in the game, Anti-Mage struggles to keep up with high movement speed heroes, so having the lockdown of these two items becomes very valuable. With the latter, you can Blink in, stun a key target before they can react, then erase them from the map quickly with auto attacks and Mana Void. From there, it’s all just luxury items. We recommend considering a Heart of Tarrasque, which happens to be one of the best items for both mobile and illusion-dependent heroes like Anti-Mage. Being able to Blink out, regenerate back up to full health, then reengage with healthy illusions should never be underestimated. Butterfly is generally not a good choice for Anti-Mage, unless you really need the evasion to go toe to toe with the enemy carry. This is because his already impressive base attack time and natural attack speed make the agility and attack speed bonuses of Butterfly less valuable than it would be on other heroes. Dealing with Anti-Mage can be a real headache, especially for newcomers to Dota 2. Harassing him early and often can keep him from sprinting towards his Battle Fury, which means that supports with long range attacks and direct damage abilities are some of his most hated lane opponents. Even forcing him to Blink away is already a big deal, as it’s time that Anti-Mage is spending being away from the creep wave. Silence effects are his worst enemy pre-Manta Style. Being unable to Blink makes Anti-Mage a huge sitting duck, so consider drafting heroes like Riki, Silencer, Doom, and Disruptor to prevent him from simply teleporting out of a gank attempt. 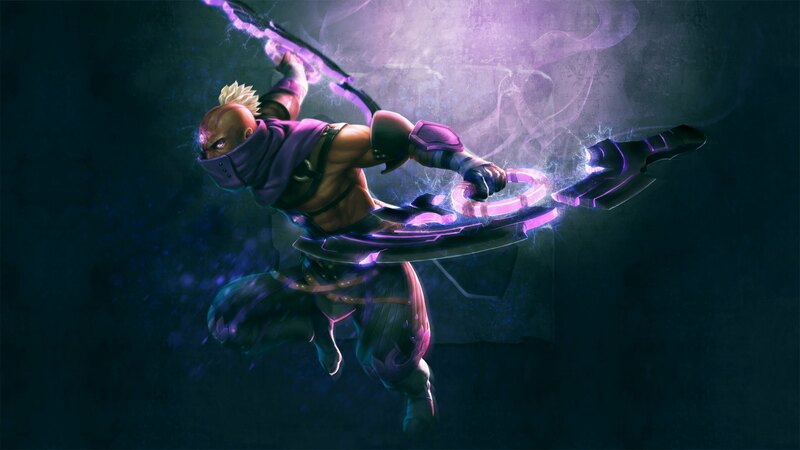 Disruptor and Riki in particular have the element of surprise against Anti-Mage, thanks to their respective silence effects being either unseeable (Riki has invisibility) or instant cast (Disruptor’s ultimate ability Static Storm). Ironically, Invoker is actually a sort of “soft” counter to Anti-Mage, despite being one of the most intelligence-heavy heroes in the game. Quas-Wex Invoker deals well with Anti-Mage in the early to mid game, thanks to the EMP + Tornado combo draining pretty much all of his Blink mana instantly. Having Orchid Malevolence on hand makes killing him even easier, as it silences him before he even has time to react. If some of his usual counters are banned, however, keeping Anti-Mage down becomes even trickier. You and your teammates could try to draft a slightly greedier lineup if you see an Anti-Mage on the other side, as he usually falls off in deep late game scenarios. Anti-Mage has no multiplicative scaling built into his kit, which means that his DPS past the 60-minute mark is low compared to harder carries like Sven, Phantom Assassin, Medusa, and Chaos Knight.